The Cane Corso is a descendant of the canis pugnax, dogs used by the Romans in warfare. 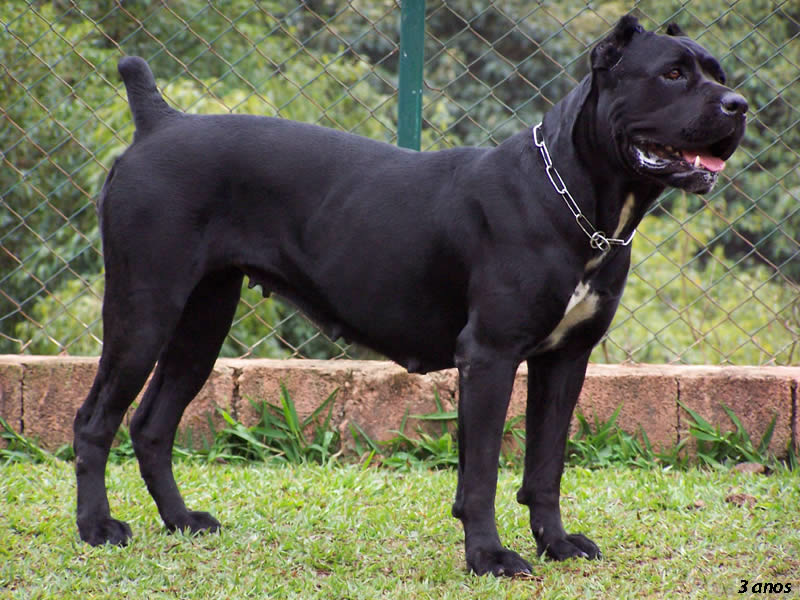 Its name derives from cane da corso, an old term for those catch dogs used in rural activities (for cattle and swine; boar hunting, and bear fighting) as distinct from cane da camera which indicates the catch dog kept as a bodyguard. In the recent past, its distribution was limited to some regions of Southern Italy, especially in Basilicata, Campania, and Apulia. The Cane Corso is a catch dog used with cattle and swine, and also in wild boar hunts. Cane Corso were also used to guard property, livestock, and families, and some continue to be used for this purpose today. Historically it has also been used by night watchmen, keepers, and, in the past, by carters and drovers. In the more distant past this breed was common all over Italy, as an ample iconography and historiography testify. As life changed in the southern Italian rural farms in the 20th century, the Corso began to become rare. A group of enthusiasts began recovery activities designed to bring the dog back from near extinction in the late 1970s. By 1994, the breed was fully accepted by the Italian Kennel Club (ENCI) as the 14th Italian breed of dog. The FCI provisionally accepted the Corso in 1997, and ten years later was fully recognised internationally. In the US, the American Kennel Club first recognized the Cane Corso in 2010. The popularity of the breed continues to grow, ranking in 50th place in the United States in 2013, a jump from 60th place in 2012.